Alciato at Glasgow: Emblem: Mediolanum. Bituricis vervex, Heduis dat Sucula signum. Terram: nam vetus hoc Gallica lingua sonat. Mutato matris virginis ante domum. Acribus hinc setis, lanitio inde levi. A ram provides the symbol for the Bituriges, a pig for the Aedui. My home country owes its origin to these peoples, a land sacred to the maiden, which they called Milan, for the ancient Gallic tongue names it so. Minerva was worshipped where now, with a change in presiding deity, Thecla is found before the house of the Virgin Mother. The city’s symbol is a woolly boar, an animal of double form, with sharp bristles at one end, smooth wool at the other. 1. patriae meae, ‘my home country’. Alciato was born near Milan, and wrote a history of the city and the surrounding area. His populis...debita origo...est, ‘owes its origin to these peoples’. In the classical period Northern Italy was occupied by Celtic tribes from Gaul. The Bituriges and Aedui were two Gallic peoples, whose language would be a form of continental Celtic. See Alciato, Historia Mediolanensis, col.1ff. Biturgia is the Latin name for the modern Bourges; Aeduorum civitas or Hedua were two of the Latin names used for modern Autun. 2. The name of Minerva, the Roman virgin goddess, was transferred to a local Celtic divinity with some similarities. 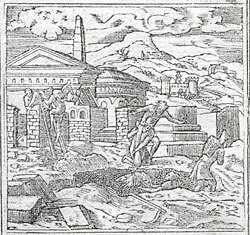 For the particular devotion of the early inhabitants to the worship of Minerva see Alciato, Historia Mediolanensis, col. 10. Tecla or Thecla was a Christian virgin martyr, supposedly a follower of St. Paul. 3. Laniger huic signum sus est, ‘The city’s symbol is a woolly boar’. This is based on a supposed etymology of the Celtic name Mediolanum (Milan), as if from medio- ‘middle’ and lana ‘wool’, .i.e. ‘half-covered in wool’. (This is found in Claudian, Epithalamium, 180ff; Sidonius Apollinaris, Epistulae 7.17.2; Isidore, Etymologiae, 15.1.) The name probably means ‘in the middle of the plain’.